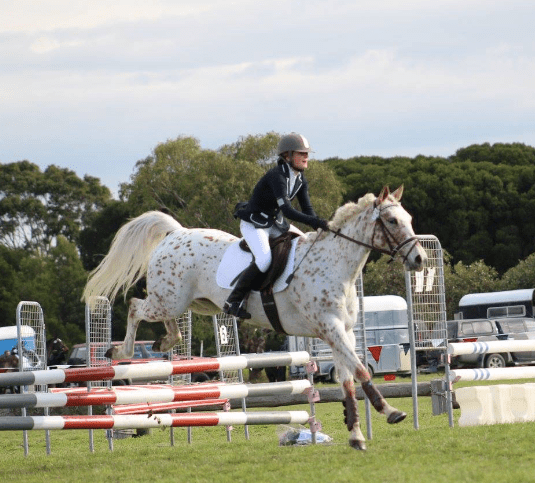 Seventeen year old Michaela Sutton and her Appaloosa mare Ima are jumping for joy, following Ima’s stunning recovery from a mystery illness! Last November, Ima was suffering a bad infection, with yellow pus oozing from the coronet bands of all four hooves. This was not responding to antibiotics and Michaela’s mum Jane was very concerned as the veterinary diagnosis was inconclusive. Their instructor, Sonia Murphy, who has a copy of my Complete Horse Herbal book, suggested they contact me for a herbal treatment program. After gathering all the vital information through a consultation, including photographs and blood tests, I prescribed and express posted my liquid herbal extract prescription, which was to be syringed orally twice daily before feeding. This remedy was to stimulate Ima’s immune system, provide a herbal antibiotic, stimulate circulation to the hooves and provide liver detoxification, as well as an appetite stimulant as she was off her feed. There was also a strict topical treatment which had to be carried out twice daily, which involved washing and gently brushing the coronet bands using my Orlando’s Coconut & Lemon Myrtle Shampoo, drying thoroughly, then applying my Artisan Skin Balm. These products provide anti-bacterial and anti-fungal properties needed for healing skin infections. At the same time Ima was slowly introduced to her own special VF Natural Diet. Within a week Ima started to respond to the treatment, and over a month, the condition cleared up completely. However other health problems presented themselves over the follwoing months, including swollen limbs, hives and a couple of mild colics. Jane, Michaela’s mother, was a wonderful client, as she was able to integrate the emergency veterinary treatment and my herbal healing treatments and make all the right decisions. This can be very confusing for many horse owners. I provided advice for some first aid measures and continued to prescribe and dispense herbs for Ima’s immune system as well as anti-virals, digestive, adrenal and lymphatic herbs. Ultimately Ima got over all her problems and became the happy, healthy mare she is today.